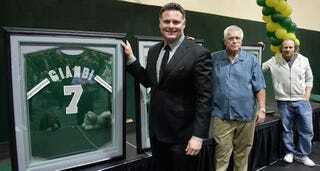 MLB players Jason and Jeremy Giambi had their numbers retired Tuesday at South Hills High School, their old high school in California. The above photo, taken by Keith Birmingham of the Pasadena Star-News, shows (from left to right) Jason, former coach Jim Bastion, and Jeremy, looking like the alter ego in a Rob Lowe TV commercial. As a reminder, Jason is 44 years old. Jeremy is 40. Aging can be so fickle.